Have you ever wanted to relive a special moment in Cowboy or Cowgirl sports history? Such as the 1988 football game of UW vs. Air Force, when UW came back and won? Or perhaps the 2007 NIT championship game of the Cowgirls vs. Wisconsin? If your answer is yes, then you’ll be pleased to know that an online inventory of all game films and documents in the Intercollegiate Athletics collection is now available. Previously, accessing the UW Intercollegiate Athletics material was like catching a Hail Mary in a Wyoming blizzard–very difficult! All that existed was a 35-page paper inventory created by a student in 2002 for 228 boxes of film. Neither the collection nor inventory was organized in any way. Although the inventory was originally created electronically in Microsoft Word, the electronic version was not readily available and paper copies were used for search and retrieval. It’s not the 1980s. We live in a world where keyword searches and 24/7 access of information is the norm. It was time to bring the Intercollegiate Athletics collection to the 21st century. Old inventory for the UW Athletics Collection. The bulky inventory was not available to patrons but rather used by AHC archivists when a patron requested a film. Because there are approximately 25 requests a year for films and other materials, our A/V archivist used it often and had it practically memorized. While this is one way to find what you’re looking for in an unorganized collection, those unfamiliar with the collections’ contents would have to scan dozens of pages to find what they needed, and there was no guarantee that we even had what they were looking for (more on this later). The Intercollegiate Athletics collection totals over 200 cubic feet. If you laid each box from end to end it would span the entire War Memorial football field, plus another thirty yards. Not only was it a large, unorganized collection, but there were inaccuracies in the titles and dates, and many of the films were unidentified. Needless to say, organizing and identifying the thousands of films and other materials was a lot of work. The new, accurate online inventory (a.k.a. finding aid) can be found here: http://rmoa.unm.edu/docviewer.php?docId=wyu-ah515001.xml. The collection is divided into three series: films, sports records, and athletic director’s email. Most films are organized by sport, and then chronologically. There are various types of films and videos including 16 millimeter reel-to-reel tape, Beta, VHS and even DVDs. The new finding aid identifies each film and video by type. The UW Intercollegiate Athletics collection is mostly comprised of game films, and most are of UW football and men’s basketball games. There is a fairly complete run of football games dating from 1938 to 2004 and a fairly complete run of men’s basketball games dating from 1978-2003. The BYU vs. Wyoming game of the October 1981 blizzard, when the Cowboys came back from a 14-point deficit to beat Jim McMahon and the Cougars; the 1987 men’s basketball team’s run in the NCAA tournament, when the cowboys were led by Fennis Dembo and Eric Leckner; and the March 2, 2002 game against Utah to win the regular season Mountain West Conference title and host the biggest crowd to see a game in the UW Arena are just some of the historical highlights included this collection. Game films of women’s basketball are also included with a fairly complete run from 2003 to 2008. The collection also includes films documenting baseball, cross country, golf, skiing, hockey, rodeo, soccer, swimming/diving, tennis, track, and volleyball from the 1980s-2000s. Wrestling is also represented and there is footage dating back to 1949. Additionally, it includes films of coaches’ shows, senior banquets, and season highlight tapes. The collection also contains physical and electronic records about UW sports, such as several scrapbooks of newspaper clippings dating 1920-1948 about UW football and basketball. A small portion of football and men’s basketball schedules, game brochures, and narrator information sheets for games are in this collection. There are also audio cassette tapes of interviews with coaches and players. 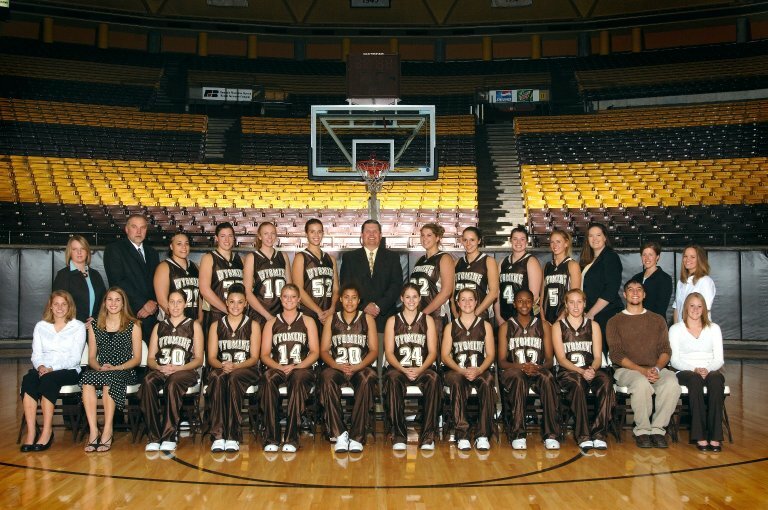 2006-2007 University of Wyoming Cowgirl basketball team. 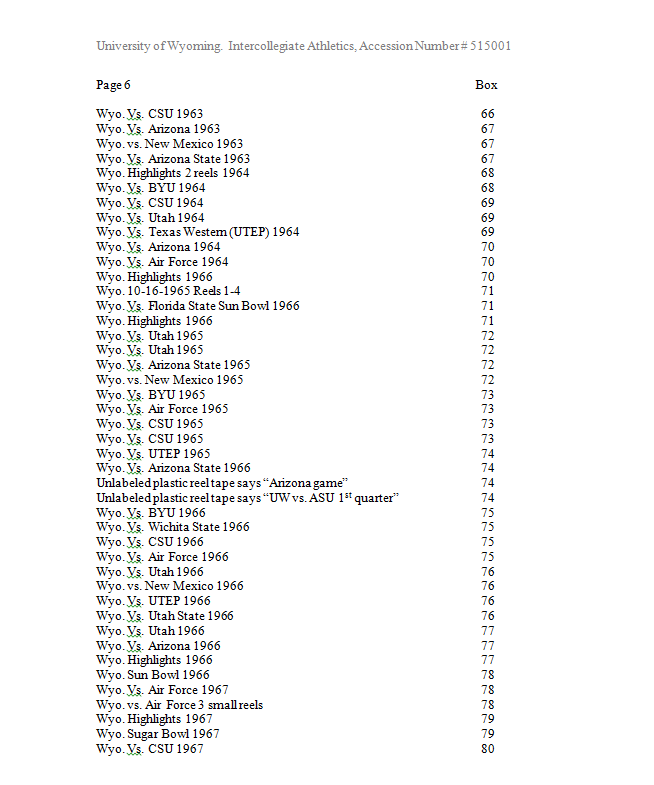 University of Wyoming Intercollegiate Athletics Records, Collection No. 515001. Why Does the AHC Have This Stuff? The American Heritage Center houses the university’s archives- permanent records documenting university history. Sports are a fundamental part of most universities, and the University of Wyoming is no exception. In fact, it could be argued that, because Wyoming has no professional NFL or NBA teams, the Wyoming Cowboys are even more essential to document. Unfortunately, acquisition of game tapes and records has been inconsistent and unstructured. We are very fortunate to have what we have, and hope to acquire both films and records documenting games and the administration for years to come. Like most sporting events, it just takes teamwork and a game plan! This entry was posted in Athletics, newly processed collections, University of Wyoming history and tagged Go Pokes, new online inventory, UW Athletics, Wyoming Cowboys. Bookmark the permalink.